The Broadcasting Board of Governors (BBG), the independent agency, which supervises the five government-funded US international broadcasting and multimedia organizations, held its latest meeting on 06 June. The BBG 2018 Action Plan was unveiled on 14 March. A number of personnel changes were announced and a wide-ranging overview of recent initiatives was given by BBG networks’ senior leaders. The board meeting highlighted also the risks faced by its journalists around the world. BBG Board Chairman Kenneth Weinstein first welcomed Acting Under Secretary for Public Diplomacy and Public Affairs Heather Nauert to her first board meeting. Nauert, who represents Secretary of State Mike Pompeo as BBG ex officio board member, expressed support for Radio Free Asia’s (RFA) Uyghur journalists, whose families are held in Chinese reeducation camps, and sympathies for those affected by the double suicide bombing that killed 25, including three Radio Free Europe/Radio Liberty (RFE/RL) journalists, in Kabul on 30 April. 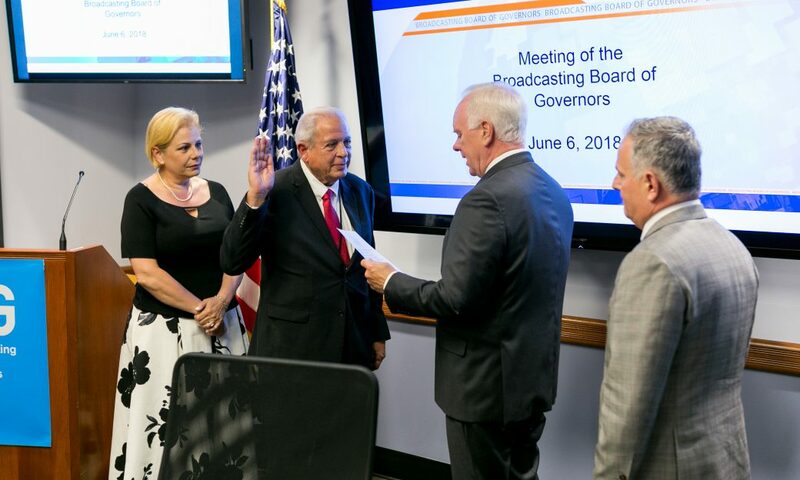 The appointment of veteran journalist Tomás P. Regalado as Director of the Office of Cuba Broadcasting (OCB), Regalado was sworn in by BBG CEO John Lansing. The departure of BBG Deputy Director Jeffrey Trimble, who will join Ohio State University after 21 years in US international broadcasting. Trimble, a fluent Russian speaker, joined the BBG as Director of Programming in 2007 after a 10-year career at RFE/RL. On 04 June the White House announced that it had sent to the Senate, for confirmation, the nomination of conservative filmmaker and documentarian Michael Pack to succeed John Lansing as BBG Chief Executive Officer for the term of three years. Leaders of the BBG networks, known as the International Media Coordinating Council (ICC), who meet twice a month, presented key initiatives and collaborative activities aimed at maximizing their operations in today’s challenging media environment. Yolanda Lopez, director Voice of America (VOA) News Center, presented “The Dragon’s Reach”, a project coordinating resources from the five networks to highlight Chinese construction and energy projects worth more than a trillion dollars in 70 countries. VOA Director Amanda Bennett announced that the five networks would cooperate for joint coverage of the Singapore meeting between the US president and the North Korean leader on 12 June. OCB Director Emilio Vasquez introduced a short video highlighting the work and programmes of the network and the challenges faced by its journalists. RFE/RL President Thomas Kent presented video reports describing the network’s coverage of recent events in Armenia that led to a peaceful change of government and of the brutal repression by Russian security forces of demonstrations in Moscow as President Putin was inaugurated. Video reports were screened to the BBG meeting. Kent said that international news networks like the BBC, CNN or France 24 used RFE/RL reports as the network, (with 19 staff in Armenia) was the only outlet to have exclusive footage of these events. RFA Director Libby Liu described the six-part RFA series “How the West was won: The making of a police state on China’s New Frontier’”. Liu listed the measures taken by the Chinese authorities to control ethnic Uyghurs, their “staggering scope” and harshness. RFA has the world’s only Uyghur broadcast and multimedia service and some of its journalists say dozens of their relatives have been detained or sent to reeducation camps to put pressure on them. Weinstein adjourned the meeting and announced that the next BBG board would convene at the Middle East Broadcasting Network (MBN) headquarters in Springfield Virginia, on 29 August.